When a molecule contains one or more chiral (light-absorbing groups or chromophores) the groups absorb left and right handed polarized light differently. This difference in absorption is called circular dichroism (CD). CD is used as a spectroscopic technique to study chiral macromolecules, particularly for the secondary structure of proteins. For being placed in an asymmetric environment. The way they interact with other chiral molecules. A vast majority of naturally occurring biomolecules are chiral. Except for glycine, all other natural amino acids are chiral. Sugars in DNA and RNA have chiral centers. These small building blocks make macromolecules and in the process imparts chirality to these macromolecules. The CD spectrum of a protein or a DNA molecule is greatly influenced by the 3-dimensional structure of the macromolecule itself. It is not merely a sum of the CD spectra of the individual chiral residues that make them. 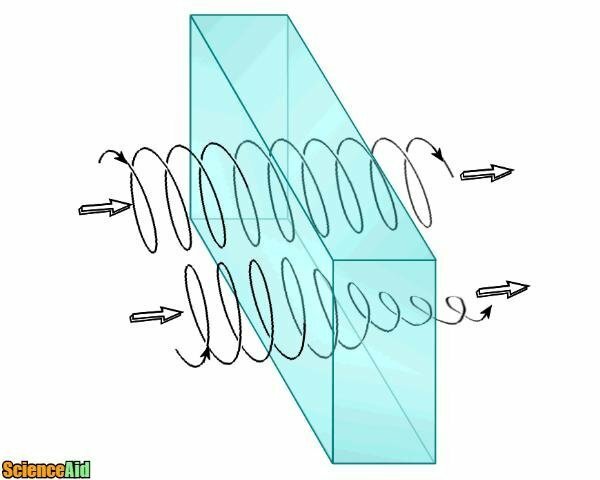 A light which oscillates in a single plane is called linearly polarized light. All polarized lights can be defined as a sum of two linearly polarized lights at right angles to each other, namely the vertically polarized light and the horizontally polarized light. If one polarized light is out of phase with the other by a quarter wave, the resultant will be a circularly polarized light . A chiral molecule absorbs left circularly polarized light and right circularly polarized light differentially. This difference in absorption is measured by CD spectroscopy. Certain structures have a signature absorption pattern and these known spectra can be utilized to analyze the structure of unknown chiral molecules. 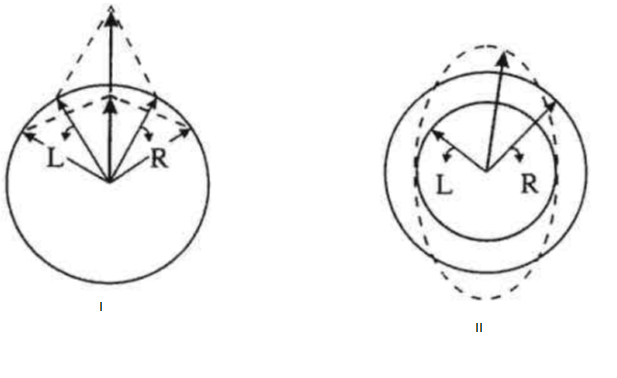 (I) The two components have the same amplitude and when combined generate plane polarized radiation (II) the components are of different magnitude and the resultant (dashed line) is elliptically polarized. (q) (q = tan-1(b/a), where b and a are the minor and major axes of the resultant ellipse). DA and q (q in degrees) is q = 32.98 DA. A CD spectrum is obtained when the dichroism is measured as a function of wavelength. In most biological work, observed ellipticities are of the order of 10 millidegrees. 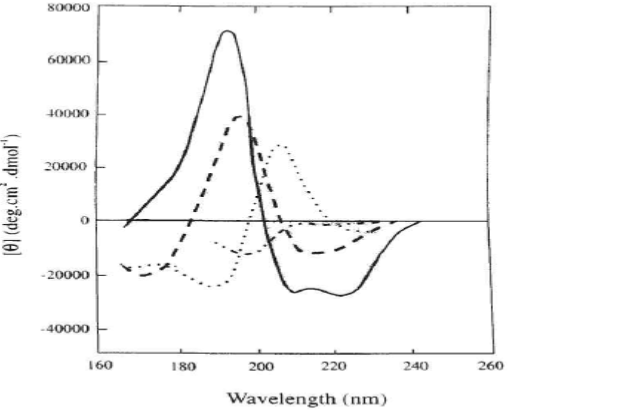 Far UV CD spectra associated with various types of secondary structure: solid curve, a-helix; long dashes, antiparallel b-sheet; dots, type I b-turn; dots and short dashes, irregular structure. molar absorbance De = eL - eR , i.e. cm-1.M-1. where q is the observed ellipticity (degrees), d is the pathlength (cm) and c is the concentration (in units of g/ml). It has a source of linearly polarized monochromatic light which can be converted to left circularly polarized light or right circularly polarized light by passing it through a quarter plate tilted at an angle of 45º to the plane of the linearly polarized light. A circular dichroism spectrophotometer has a specialized optical element called a photo-elastic modulator (PEM); a piezoelectric element cemented to a block of fused silica. When the piezoelectric element oscillates at its resonance frequency (typically around 50 kHz), it induces stress in the silica in such a way that it becomes birefringent (having two different refractive indices). The alternating stress causes the fused silica quarter plate to retard the vertical with respect to horizontal components of the incident linearly polarized light by a quarter-wave to produce left-circularly polarized light(CPL) and then vice versa. The amplitude of the oscillation is adjusted according to the wavelength of light passing through the silica block. A light detector on the other side of the sample records the light intensity hitting the detector. When a circularly dichroic sample is placed in the light path, the recorded light intensity will be different for right- and left-CPL. The difference in intensity between the two circular polarizations (vAC) is measured by a lock-in amplifier tuned to the frequency of the PEM. MLA (Modern Language Association) "Understanding Circular Dichroism." ScienceAid, scienceaid.net/Understand_Circular_Dichroism Accessed 23 Apr 2019. Chicago / Turabian ScienceAid.net. "Understanding Circular Dichroism." Accessed Apr 23, 2019. https://scienceaid.net/Understand_Circular_Dichroism.